Henry Champion Deming from Men of Progress edited by Richard Burton, 1898. Henry Champion Deming wanted to be a writer more than a lawyer. Born in Colchester, Connecticut, on May 23, 1815, he attended Yale (where earned a reputation as a gifted writer and public speaker) and then graduated from Harvard Law School in 1839. After graduation, Deming moved to New York where he took more of an interest in writing and publishing than he did in growing a legal practice. It was not until 1847 that Deming moved to Hartford and opened a law office. Henry Champion Deming from Men of Progress, edited by Richard Burton, 1898. In 1849 he entered the political arena as a member of the Connecticut House of Representatives, and later, served as a state senator. He also served multiple terms as Hartford’s mayor, from 1854 to 1858 and again from 1860 to 1862. Deming’s last year as Hartford’s mayor coincided with his entry into the Civil War, as colonel of the Twelfth Regiment of Connecticut Volunteers. The Twelfth Regiment served as part of a force of 15,000 troops under the command of General Benjamin F. Butler that captured the city of New Orleans, Louisiana, in April of 1862—assisted greatly by 43 ships under Admiral David Farragut that entered the lower Mississippi River and supported the attack. Butler held New Orleans for the remainder of the war (a significant blow to the Confederacy) and named Deming the city’s provisional mayor until Deming’s resignation in January of 1863. Deming returned to Hartford after the war and used his exceptional oratory skills to win election to Congress. There he served on the Committee of Military Affairs and as chairman of the Committee on War Expenditures. It was during this period that Deming returned to writing, penning an influential biography of Ulysses S. Grant that portrayed the general as a capable leader possessing an unassailable character. After Grant’s election as president, Grant appointed Deming the Collector of Internal Revenue, a position Deming held until his death in Hartford on October 9, 1872. “Colchester Historical Society,” 2014. Link. Frantz, Edward O, ed. A Companion to the Reconstruction Presidents, 1865-1881. Chichester, West Sussex: Wiley-Blackwell, 2014. Deming, Henry Champion. An Oration Upon the Life and Services of Gen. David Wooster. Hartford, CT: Press of Case, Tiffany and Company, 1854. Link. Burton, Richard, ed. 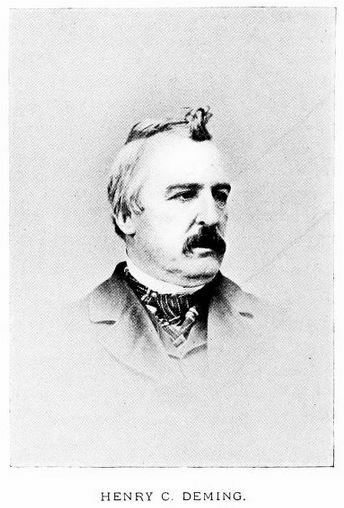 “Deming, Henry Champion.” In Men of Progress; Biographical Sketches and Portraits of Leaders in Business and Professional Life in and of the State of Connecticut. Boston, MA: New England Magazine, 1898. Link. Deming, Henry Champion. Eulogy of Abraham Lincoln: Before the General Assembly of Connecticut, at Allyn Hall, Hartford, Thursday, June 8th, 1865. Hartford, CT: A.N. Clark & Co., State Printers, 1865. Link. Deming, Henry Champion. The Life of Ulysses S. Grant, General United States Army. Hartford, CT: S.S. Scranton & Company, 1868. Link.